Look at these little darlings! Cornish sardines are wonderful and are just starting to appear at the fishmongers, although their proper season is really the end of June until February. I popped round to see my folks earlier and came out with a bag of these, as you do. I never come away from visiting them empty handed. Sometimes it's a block of pecorino, Mum's legendary meatballs, Dad's painstakingly dried herbs or home grown veg. Last week I even got a whole rack of ribs! It's not the only reason I go visit them - promise! I was in a super rush as I had a gig to get to so needed something quick, quick, quick and these were just the ticket. I thinly sliced some potatoes and threw them in the oven with olive oil, sea salt and some finely chopped rosemary to crispen up for about 20 mins. I quickly washed and gutted the fish, seasoned them so they were ready to be popped into the oven for the last 8 minutes, turning once. 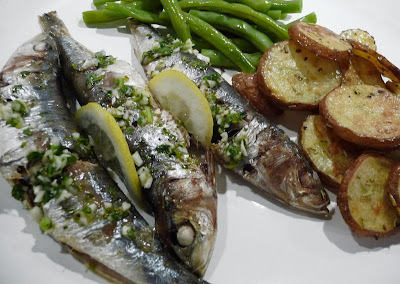 These little fish were so fresh so I thought a simple gremolata would work a treat with them and just poured this over once they had come out of the oven, serving them with some green beans. Super quick and nutritious fish and chips, perfect on the fly!